It is a great satisfaction to inform you that the new project entirely signed by Mondani Family is online: MondaniWeb, the new, irresistible, luxury shopping style. MondaniWeb is perfect for those who want to buy and those who want to sell. 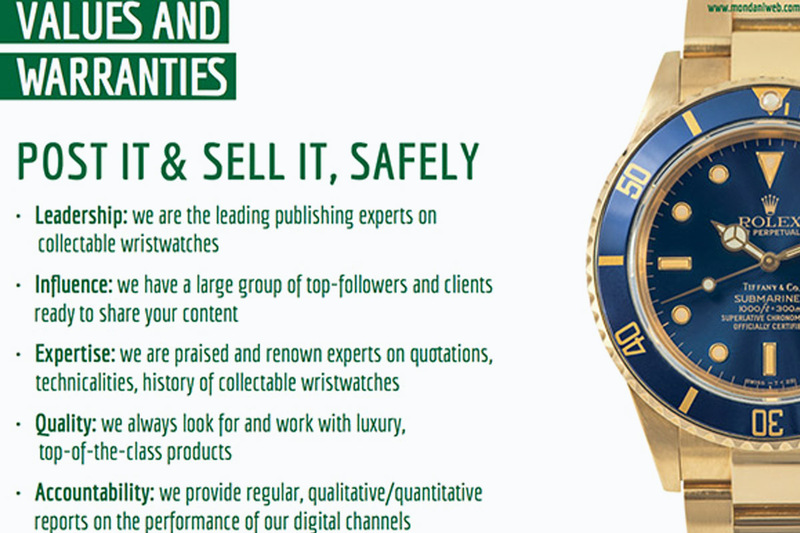 At this link you will find high quality watches for sale with the world’s most reliable dealers. Both vintage and modern timepieces are offered and between the main brands you can find: Rolex, Patek Philippe, Tudor, Omega, Cartier, Longines, Richard Mille, Tiffany and more. You will also find stunning jewels, diamonds, bracelets and various accessories. We will post and push them on our digital channels, with our leading worldwide reputation. Our fans are ready to interact and promote your products. That’s it! You will start gaining visibility, contacts and profits. We offer you a first-order space on our leading digital channels to promote your products. We have a complete set of digital channels: all the main social media, from mainstream Facebook with over 500’000 fans to innovative Snapchat, our newsletter with more than 600’000 subscribers, our website – all with thousands of qualified contacts and over a million followers. We also have a large number of top-followers ready to like and share your content, thus spreading it furthermore. All you have to do is choosing which channels are most suited and for how long your products shall be exhibited – We do the rest.